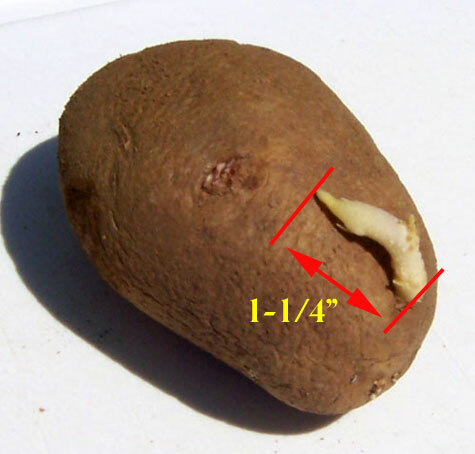 A request was sent in asking for some help regarding the proper scoring guidelines for sprouts on potatoes. A grade standard was published in 2011, which has more than a few confusing statements. To keep things simple I will take it one step at a time The lengths mentioned below include the length of a single sprout. For damage (will not make a U.S. No. 1)- the sprouts may not be longer than 1/4 inch in length. This includes a single sprout or a cluster of sprouts. For serious damage (will not make a U.S. No. 2)- the sprouts may not be longer than 1/2 inch in length. Not that sprouts are found too often while packing, and if they are, the potatoes are run over rollers to knock off the sprouts. For damage (will not make a U.S. No. 1)- the sprouts may not be longer than 1/2 inch in length. This includes any single sprout. For serious damage (will not make a U.S. No. 2)- the sprouts may not be longer than 1 inch in length. Looking at the image above, the sprout is 1-1/4 inches in length. If we were inspecting these potatoes at a receiver’s warehouse, this potato would be scored as a defect, as serious damage, against the U.S. No. 2 Grade. Any sprout longer than 1 inch in length is serious damage. If the potatoes were being inspected on a U.S. No. 1 basis sprouts are never scored as a serious damage. 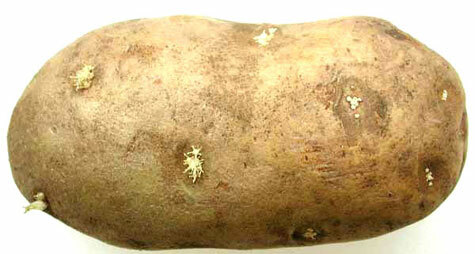 This image above is showing a potato with one cluster. Because it is a cluster, a different guideline applies. 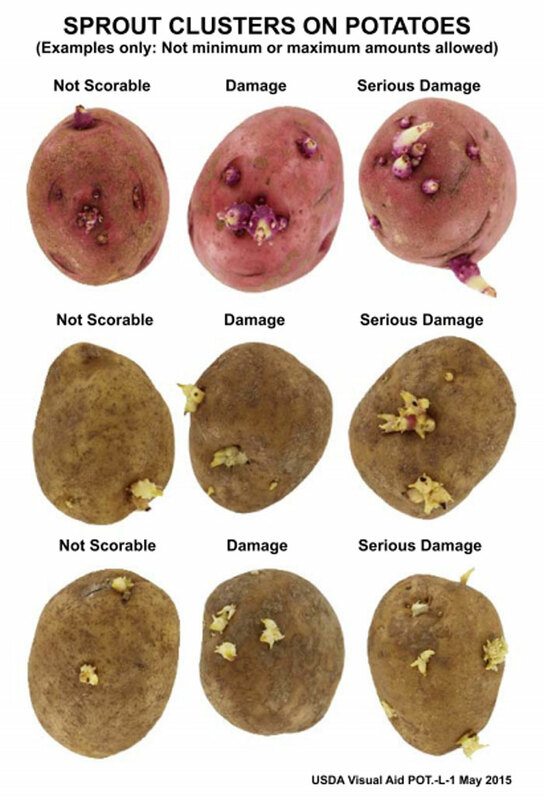 Potatoes are scored as defects when the sprout clusters materially affect the appearance, or when inspecting on U.S. No. 2 Grade, sprout clusters are scored as defects when seriously affecting the appearance. Let’s take a look at the last image. It shows a potato with multiple sprouts and clusters of sprouts. If you combine, or add up all the lengths, it appears the aggregate length is more than 1/2 inch in length. Is this a defect? No, this would not be a defect, as this would be a No. 1 potato at the receiver’s warehouse and even at the packing house. You do not combine the length of all the sprouts. In fact every sprout and sprout cluster could be 1/2 in length, and as long as no one sprout exceeded the 1/2 inch length, it is a U.S. No. 1 potato. In other words, the many sprouts on this potato materially affect the appearance. No one would disagree. But, according to the US Grade Standards, sprouts just emerging, no matter how many, have no affect on whether the potato is a defect or not. Now the next question; how many potatoes with sprouts are you allowed to have? Sprouts are considered as defects, but they have their own special allowance, separate from the other defects. 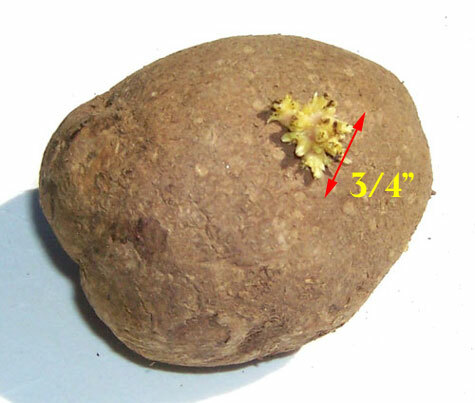 Simply put, you are allowed to have not more than 5% of potatoes with scoreable sprouts when inspecting on a U.S. No. 1 basis, or if you are inspecting on a U.S. No. 2 basis then 10% of the potatoes may have sprouts scored as serious damage. The USDA has developed a visual aid to help you identify clusters of sprouts as being a defect, as damage (against the U.S. No. 1 Grade) or as serious damage (against the U.S. No. 2 Grade). I hope this was some help, to clear up the confusion. The main confusion comes from an internal memo from the USDA. The memo states that any scoreable sprouts, in excess of the 5% allowance, would be counted against the (7%) lot tolerance. In other words, if you had no other defect, other than sprouts, you would be allowed 12% damaged by sprouts (7% in excess of the 5% allowance). This policy is in direct conflict with the standard. Maybe a revised standard will reflect this change in policy. More than 5% sprouts, the lot should be out. At least for potatoes, the USDA has ruled that even though you are allowed a 5% for allowance for sprouts, the potatoes with sprouts in excess of the allowance are scored against the total lot tolerance, of 7% at destination. What this means, if the allowance is exceeded, the lot fails to grade….. period. The amount over the allowance is not added to the lot tolerance. We’ll see if their policy changes with potatoes to stay consistent with other commodities, or will they change the policy of the other commodities to now coincide with potatoes. throws a standardization question your way. It’s a brave new inspection world out there.